The crust of this bread comes out almost black. Fortunately Nancy Silverton warns of this, or I would have thought I was burning the bread after only 30 minutes. The only bread I've seen darker than this is Syd's squid ink bread. But I didn't use any of that. I must have read this somewhere on TFL as I'm hardly a gourmand, but this bread is just made to go with goat cheese. What a treat. So two questions. Has anyone been to Standard Baking? (Karin?) 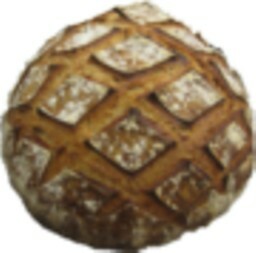 Any chance that this is the same bread as they sell there? What is your favorite bread from Silverton's book? I can't wait to try something else. Black crust? Never a problem. This version is from King Arthur's Martin Philip. Quite a coincidence! Lovely bread and the photo with the goats cheese and berries does indeed look like a real treat. Yum, your bread, and the accompaniments, look delicious. So kind of Andy to give you the link to MC's post about the fig-anise bread developed in Martin Philip's class at KCW - this was good bread, happy you found the fig-anise in Ms Silverton's book good, too. Other recipes to try in that book? louie brown's blog features some beauties (olive bread and fougasse). THis loaf looks great. Crust looks fine too. I have been experimenting with high baking temps a lot lately so I am not frightened by charcoal colored loaves. People love them too. Did the Cadco arrive yet? I keep waiting to hear so I imagine you are still awaiting delivery and instillation…. Had no idea there were so many versions of fig anise bread. I guess it's just like peanut butter and jelly. Cadco is sitting in the garage waiting. Just got the table in place, and rearranged the furniture to fit it in. Electrician coming this week. Then water hook up and then I'll start baking. Can't wait. Now that I am baking with the Electrolux I had installed in late spring (kitchen wall oven for winter baking while Cadco gets overflow in the cooler months and is used exclusively in the summer - in the garage :) I have gotten a feel for how it bakes compared to the Cadco. Here are my findings that may help you adjust temps and bake times. Electrolux is convection but the fan isn't nearly as forceful as the Cadco's fan. Cadco produces a much darker crust on breads baked at the same temp. as the Electrolux so if you don't want dark crusts you might want to drop heat temps down 25-50°. Bake times are pretty much the same. You did a great job with the fig anise loaf. I came across a similar loaf in Portland (the one on the west coast) from the Pearl Bakery that I tried to duplicate, but I was never fully satisfied with the results. Coincidentally, MC (Farine) just posted a recipe for a similar bread that you may find interesting. You can find it here. And I agree that the tartness of a soft goat cheese complements the sweet fig flavors well. of bread that Lucy comes up with, we might have done a bread that had figs and anise in it along with who knows what else but we never had one ever go so dark and gorgeous like yours. Just beautiful. Lucy says she is thinking about taking back your well earned The Crumby Baker title for the fine crumb in your Doubled Chocolate Malt and other breads.and changing it to The Crumby & Crusty Baker instead. Beautiful loaf Varda...I would be leery about anise as well but you have convinced me I may need to try this one. Curious how your customer will like this bread compared to what they had before. Hi Varda, lovely loaves! 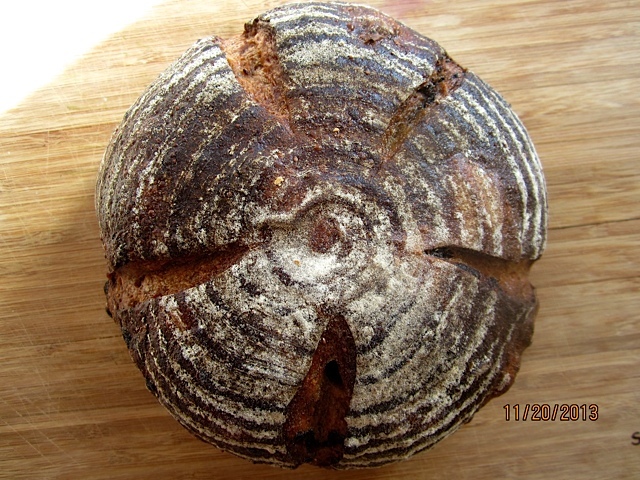 Hamelman has a Anise-Fig formula too that calls for 50% wholewheat flour. I think it includes rosemary too and the combination of flavours work really well. One of my favourite fruit loaves with the warm touch of the anise and rosemary. Silverton has many interesting formulas, though some of them involve so much preparation. The walnut loaf is pretty good too and it's quite popular in tfl. Your bread looks wonderful, Varda! I don't remember having seen a fig anise bread at Standard Baking, but I will look out for it when I go there next time. They have often daily specials, I don't think it's a bread they bake on a regular base. I don't own Nancy Silverton's book (yet), I just brought Lutz Geißler's "Das Brotbackbuch" from Germany, and can't wait to bake my way through it. I will be in Portland next week and see whether they have the bread on Wednesday. The Standard Baking Co. book is very good, I made 4 things from it so far, and all were great, especially the croissants. Thanks for reminding us of this wonderful combination, Varda And yours is a fine example. Congrats on you new oven btw. i admire your efforts in baking for public, it is no easy task. They sell it in a plastic bag, so the crust is soft. It has a strong, almost licorice taste (the sweet kind, not the salty), is sweet, but only slightly, more from the figs than from sweetener in the dough. I'm pretty sure it is made with some whole wheat. It tastes good with butter, and I can imagine it would be good with cheese, too. I'm pretty positive I did taste whole wheat, but it definitely wasn't a 100% whole wheat bread. I don't think they used a fig puree, only chunks. Standard Baking sells most breads unwrapped, only a few are in plastic bags, probably because the crust is semisoft, and not meant to be crisp. I ate today the last of the Fig Anise Bread, it kept very well (another reason I'm sure there was whole wheat in it), and it tasted really good toasted. Normally this isn't the kind of bread I would buy, because it's sweetish, but it really grew on me. The fig-anise combination goes as far back as Roman times, I believe. 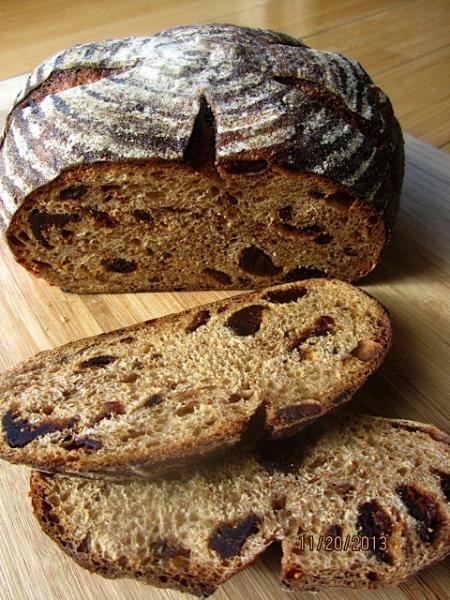 Richard Bertinet has a great recipe for a similar bread with rum soaked figs infused with cardamon. I was corrected the other day by someone who told me that correct spelling of cardamom was cardamom and not cardamon as I had on my ingredient sheet. I was disbelieving and she looked it up and it turns out that spelling with an "n" at the end is an alternate spelling. But when I got home I checked my bag of cardamom and sure enough it was spelled with an "m"
Of course you could use the same dough as Silverton's, but the prunes are so flavorful I found Bertinet's straight dough surprisingly good for this bread. The prune-rum-cardamom combo is worth remembering.